Gibson SG faded special... that one can't be replaced by just any SG. with PANACHE... which is crucial. doing useful work, and replace my losses if nobody else would help me. never see their like again. Save the people first, then save the instruments that can't be replaced, and that have their own voice. King, any guitar is replaceable. Your life is NOT. most deadly danger we ever face. For musicians, we do it every day. my life for my music literally hundreds of times. or more than that. that I can't just blink out, and/or so tough that I can't just die after sustaining horrendous road injuries. 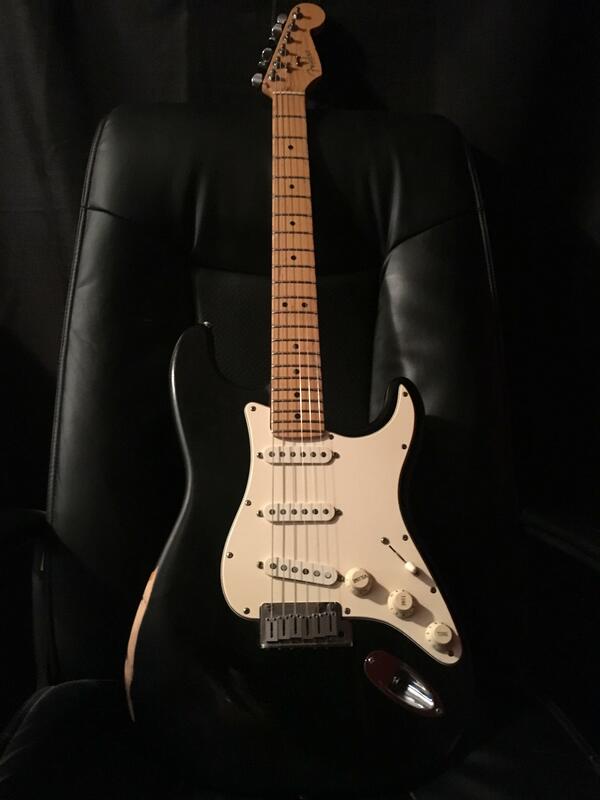 Is a guitar worth it? Maybe, and maybe not. in between the lines of the patriarch (s). Chubbles, Blucifer, cerebral gasket and 2 others like this. I don't know how that faded sounds but you somehow managed to turn the stock "faded" finish into something spectacular. Add that pickguard and that is one amazing and unique looking guitar! I dont think it is crucial to save an instrument if there are more irreplacable things at stake, once your gone you can't come back. Even if the guitar is gone the music remains. Thats not to say there isn't legitimate sentimental value in our instruments but is it the same that we feel for our loved ones? Not quite. Someone on here once said they were more concerned about their fancy vehicle than their guitar, that I cannot empathize with. 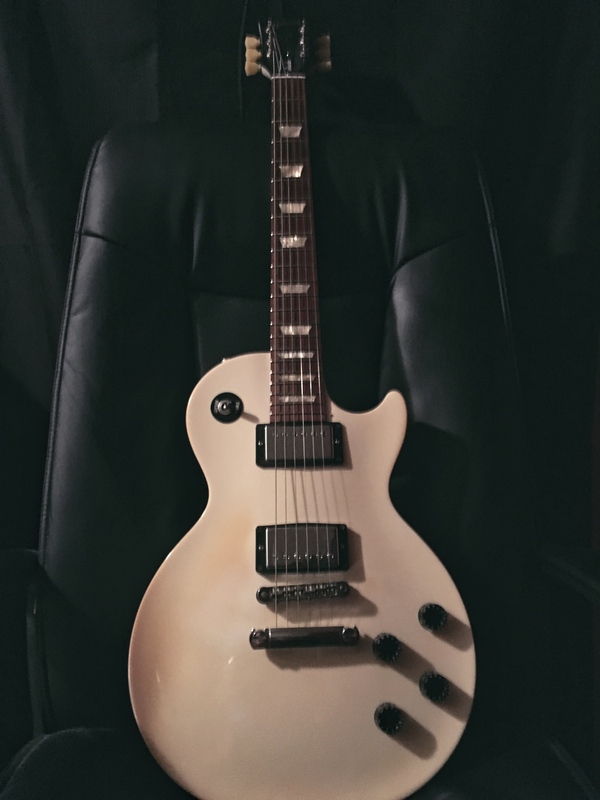 I'd like it to be my '06 Les Paul Standard, but in reality it would probably be my '18 Billie Joe Armstrong Sig LP Jr as it was such a limited run and can't be replaced. I'd grab one in each hand. I really need to train my cat to drag a couple Les Pauls out of a burning house. Col Mustard, Thumpalumpacus, arcticsg and 1 other person like this. What model is that left one? 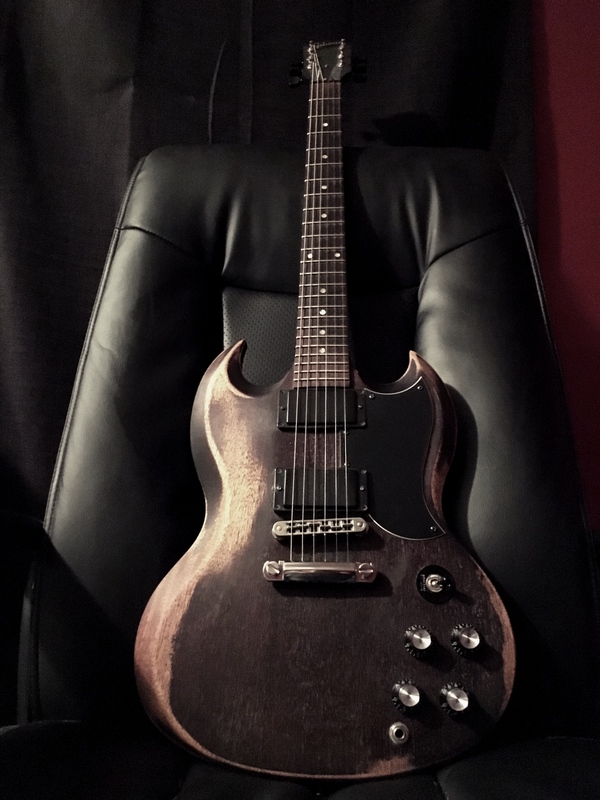 1973 Standard with an ABR-1 bridge? 1974 Standard that had the harmonica bridge swapped out for an ABR 1 at some point. Edited to add- to me it's slim compared to the other Nasville bridges I have so even though the adjusting screws are facing the bridge instead of the bridge pickup, I'm calling it an ABR 1. I'm embarrassed to admit I can't always tell the difference. They'd suffer a few dents, but technically, I can easily hold 2 guitars face to face in each hand. Enough room for the new SG Standard, my Gibson LP Studio, my precious SGJ and my trusty old black Fender Strat. Layne Matz, Col Mustard and arcticsg like this. in my pore old head when I started playing that guitar at home. guitar been all my life?" mindful of the phases of the moon. And I still am. That humble faded special sounds like a million. time I touched her. Rang like a bell unamplified. Queen. She's elegant or trashy at a flick of a switch, but Luna is the Queen of my music room. The Queen gets escorted to safety first. Rain and Layne Matz like this. fist, you'd have to try an open the door with yer Strat. one of the other fine instruments, but not the Fender. This is a very overlooked aspect of Fenders for many guitarists who are used to the fragility of a set neck impeccable Gibson, PRS or whatever. These things can take the most absurd careless abuse imaginable and still play efficiently, I just cant say the same for my SG. Thats not to say that set necks fdont have their place, durability isnt everything- neither is versitality. Watch SRV play Third Stone From the Sun live, if that were an SG the neck would have been off WAY before the song was over. Can I chuck them out the window onto the grass? I bet I could get 7 or 8 out in the same time as 1 out the front door. Please? I think there's some cheating going on here. We started with "save" one guitar yikes. Geez louis unless you are some kind of eccentric extra armed creature most of us have to pick one at a time to play. I unfortunately do not have the copy of the fool that I posted on the first page of this thread. ( I am eyeballing it on reverb but ... well ... 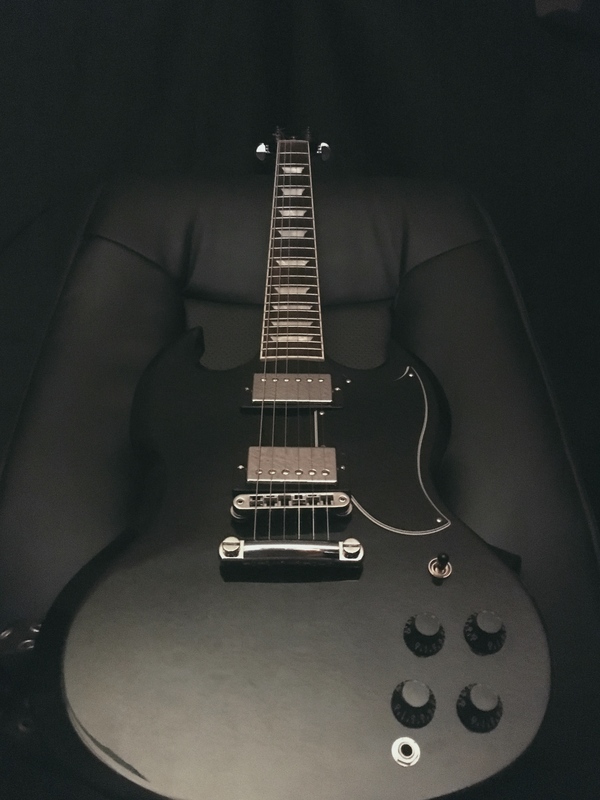 I kind of think my wife may notice that guitar looks a bit dit different than the other guitars ... plus its a bit out of my price range ). Layne Matz and Rain like this. Steve D, arcticsg, Rain and 1 other person like this. Exactly. I've had that guitar for almost 25 years now. It's been played in the rain, had beer and wine spilled over the electronics countless times, was dropped multiple times, stepped on, beaten, smashed against a tombstone. It was kept in a room where I smoked 2 packs a day for years. It started its life in humid, freezing Canada, travelled all over the world and is sitting here with me in the arid Nevada desert since 2012. And the only maintenance it ever required in all those years was to have the pots and switch cleaned up and lubed. That's it. Never had any intonation issue. The frets would now need some TLC, but that's only normal. Col Mustard, arcticsg, Layne Matz and 1 other person like this. 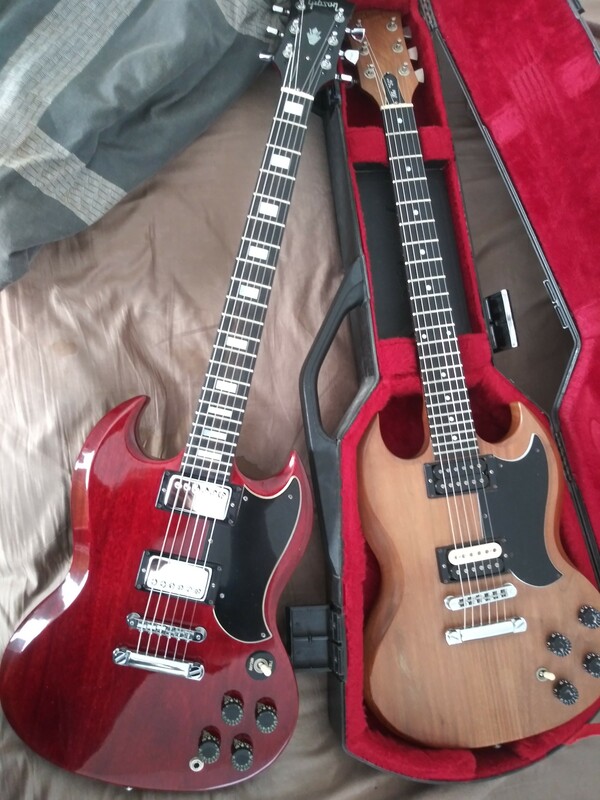 Definately these two 2016 Gibson SG Standard & 2010 Fender Jaguar. EDIT: Excuse the mess it was temporary. Col Mustard and koaguilds like this. I've heard lots of good things about those Harley Bentons. Interesting to see someone here list one as "the one to save". That one has a very nice top to it, good looking guitar. They are so cheap that I've been toying with trying to sneak one more new guitar past my ever vigilant wife. I mean, at like $200 how can you go wrong? If nothing else it could be used as the frame for mad scientist style guitar modding experiments. But again, all I hear from people who have them is "I thought I'd change the pickups but I actually like it the way it is". Layne Matz and Chubbles like this. I heard the same things. The feel of the neck is awesome: bound with inlays. I wanted to try it. I'm glad I did. It's set up in Germany, and has a 3 year warranty. Returning it would be a PIA. I look at it as a better alternative to an Epiphone. Dang its going to take a while to get here! to see what everyone might say. And because we are sometimes stuck in a rut on a guitar forum, with some topics coming up over and over.